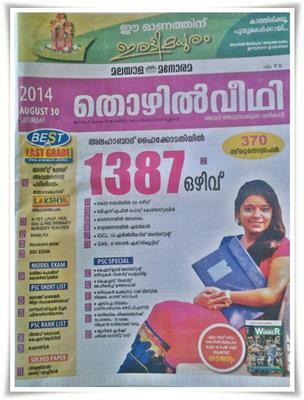 Malayala Manorama Thozhilveedhi 30th August 2014 issue (25th August - Today) is now in stands. To read the latest issue of Malayala Manorama Thozhilveedhi dated 30 August 2014, buy a copy from your local book vendor. Thozhilveedhi from M M Group is one of the leading employment weekly which features updated news on arising opportunities in public and private sectors. Malayala Manorama Thozhilveedhi, one of the leading employment newspaper in Kerala has published its 30th August 2014 edition. Like its previous issues, the current issue of 'Thozhilveedhi' comes with a lot of arising opportunities in various fields. The major features of this issue are the vacancies in Allahabad High Court, Union Service, Head Constable in BS, Army, Air Force Airman, Engineering Assistant in IOCL and Non Executive in GAIL. Along with PSC Notification, Model Paper, Kerala PSC Short list, PSC Rank List and Solved Paper are also found its place in the released edition. While going through the pages, 1387 vacancies in Allahabad High Court, 159 in Union Service, vacancies for Head Constable in BSF, Opening in Army, Air Force Airman, 113 in Engineering Assistant in IOCL and 81 Non Executive in GAIL are also reported. 67 vacancies in PDIL, 133 in Haryana, 87 in FDDI, 50 Stipend Trainee in RRCAT, 64 jobs in CMPDI are given with prominence. Crash coaching for Last Grade Exam, K-TET, LP/UP, HAS, DEd & Pre Primary,/Nursery Teacher, Bank PO, Cooperative Bank and SSC Exam are published in the 30th August 2014 issue of Thozhilveedhi. This special training will help the candidates to take sample test much before the examinations. This issue also contains Model Paper of Women Constable, Short list of Branch Manager - District Cooperative Bank, Ayah - Kozhikode etc, Nursery School Teacher, Scheduled Tribe, PSC Rank List of Reserve Driver KSRTC and Forester, Solved Paper of Villageman Revenue & Night Watchman/ Watchman have found its place in the current edition. The free booklist 'Competitive Winner' which is accompanied along with 'Thozhilveedhi' is a complete General Knowledge companion. As General Knowledge is given prominence in all prominent exams, this booklet will guide the candidates to score high marks. Being one of the most read employment newspaper, 'Thozhilveedhi' has delivered full support to youngsters to enlighten themselves and also to building up a proper career. It has already established as an powerful platform for job seekers to prepare well and make a ground work for their career development. f you are a job seeker, buy the 30th August 2014 issue of 'Thozhilveedhi' from your nearest book vendor and make your dream come true.